Anyone who has ever owned a car in a snowy town – or a boat in a salty sea – can tell you just how expensive corrosion can be. 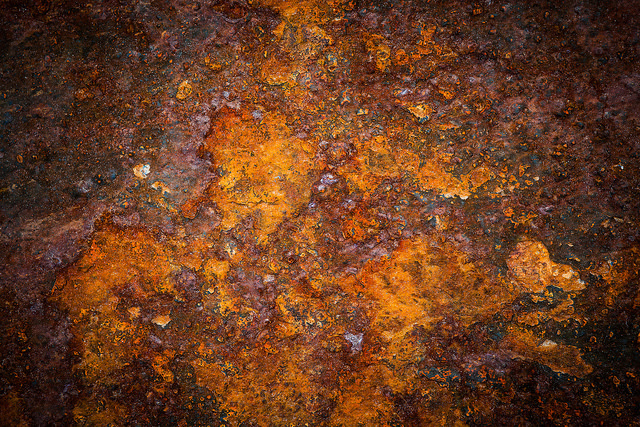 Typically, the process of corrosion has been studied from the metal side of the equation. One of the world’s most common and costly chemical reactions, corrosion happens frequently at the boundaries between water and metal surfaces. In the past, the process of corrosion has mostly been studied from the metal side of the equation. However, in a new study, scientists at the Center for Nanoscale Materials at the U.S. Department of Energy’s Argonne National Laboratory investigated the problem from the other side, looking at the dynamics of water containing dissolved ions located in the regions near a metal surface. Under low-chlorine conditions, water tends to form two-dimensional ordered layers near solid interfaces because of the influence of its strong hydrogen bonds. However, the researchers found that increasing the proportion of chlorine ions above a certain threshold causes a change in which the solution loses its ordered nature near the surface and begins to act similar to water away from the surface. This transition, in turn, can increase the rate at which materials corrode as well as the freezing temperature of the solution. This switch between an ordered and a disordered structure near the metal surface happens incredibly quickly, in just fractions of a nanosecond. The speed of the chemical reaction necessitates the use of high-performance computers like Argonne’s Blue/Gene Q supercomputer, Mira. To further explore these electrochemical oxide interfaces with high-performance computers, Sankaranarayanan and his colleagues from Argonne, Harvard University and the University of Missouri have also been awarded 40 million processor-hours of time on Mira. “Having the ability to look at these reactions in a more powerful simulation will give us the opportunity to make a more educated guess of the rates of corrosion for different scenarios,” Sankaranarayanan said. Such studies will open up for the first time fundamental studies of corrosion behavior and will allow scientists to tailor materials surfaces to improve the stability and lifetime of materials. The work was funded by the U.S. Department of Energy’s Office of Science and the results appeared in the December 11 edition of Physical Review E in an article entitled ​“Chloride ions induce order-disorder transition at water-oxide interfaces.” Co-authors on the paper included Ganesh Kamath from the University of Missouri and Sanket Deskmukh from Argonne. The Argonne Leadership Computing Facility is one of two DOE Leadership Computing Facility (LCF) centers in the nation dedicated to open science. Supported by the DOE’s Advanced Scientific Computing Research program, the LCF operates two centers, at Argonne National Laboratory and at Oak Ridge National Laboratory, and deploys two diverse high-performance computer architectures that are 10 to 100 times more powerful than systems typically available for open scientific research. The LCF provides world-class computational capabilities to the scientific and engineering community to advance fundamental discovery and understanding in a broad range of disciplines. For more information please visit http://​www​.alcf​.anl​.gov for the Argonne center and http://​sci​ence​.ener​gy​.gov/​a​s​c​r​/​f​a​c​i​l​i​ties/ for the DOE LCF.